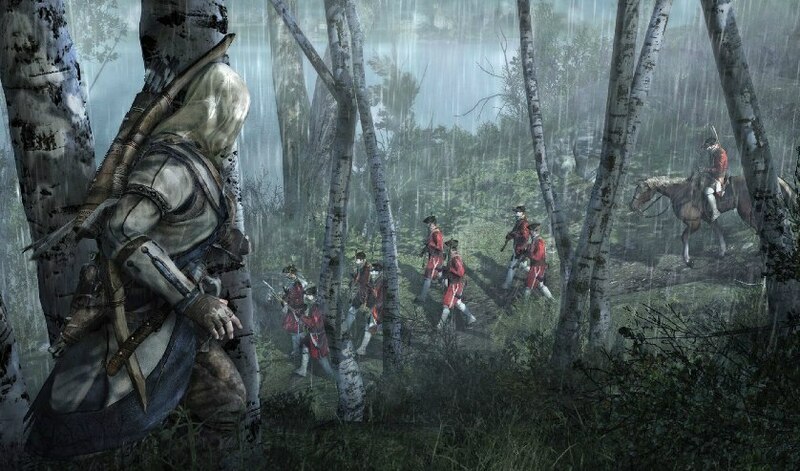 Connor is the famed protagonist of Assassins Creed 3 who is Half British and Half Mohawk. In the latest teaser trailer Connor is on the hunt of something more elusive than deer or any other form of wildlife, he is however hunting down a British soldier like an animal by shooting a well placed arrow in his calf and walking in slowly for the kill with his Tomahawk and a new Hidden Black which comes out like a switchblade but the trailer cuts short and links you to a page to help unlock a full gameplay trailer. Whether you hate it or love it Assassins Creed is one of the most loved annual release games of Ubisoft and Assassins Creed 3 shows us a new protagonist to sink our hands into as the chapter of Ezio Auditore and Altair is finally put to a fitting conclusion. The trailer links players to the games website which they must visit to help unlock the global gameplay trailer, you can like the page Here and its needless to say that the faster we spread this link the faster we get some proper in game footage of the game and stop drooling over screenshots of the game. Connor is the next assassin and the game takes place in the war of 1776 (American Revolution Era) and you will be working with the Assassins to once again put a stop to the templar’s plans and to annihilate as many of them as possible, be they American or British. The protagonist isn’t the only thing new in the game, what is surprising is that the game has been in development for 3 years now and there are elements in this game which will surely make it a new favorite of the fans; such as the bow and arrow instead of the traditional crossbow of the previous games, a new hidden blade which comes out like a switch blade and of course proper American Revolution era rifles and pistols and outdoor combat where Connor takes to the safety of the forest by hiding in trees and being the ultimate predator. The game releases on October 30th for the XBOX 360 and the PS3 and on a later date for the PC and the Wii-U.